Tibet Dalai Lama News » Blog Archive » His Holiness the Dalai Lama: Compassion is one thing we need, but being realistic is another. 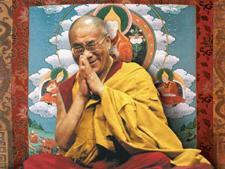 His Holiness the Dalai Lama: Compassion is one thing we need, but being realistic is another. Minneapolis, MN, USA – After yesterday’s rain, it was bright and clear as His Holiness the Dalai Lama drove to the William F Austin Building on the Starkey Campus this morning. Bill and Tani Austin welcomed him and introduced him to Forest Whitaker the moderator of the morning’s panel discussion, who he first met last year. In the auditorium, Tani Austin introduced the panel to an audience of about 250 politicians, businessmen and women and Starkey employees. She spoke of her husband, Bill Austin’s rise from humble beginnings to being a world citizen. Actor Forest Whitaker, as well as working to empower children in places of conflict, is an advocate of sustainable development and a UNESCO Goodwill Ambassador. In describing His Holiness as needing no introduction Mrs Austin meant that everyone in the room had heard his name, but she said she wanted to read a summary of his life so they would also understand something about him. 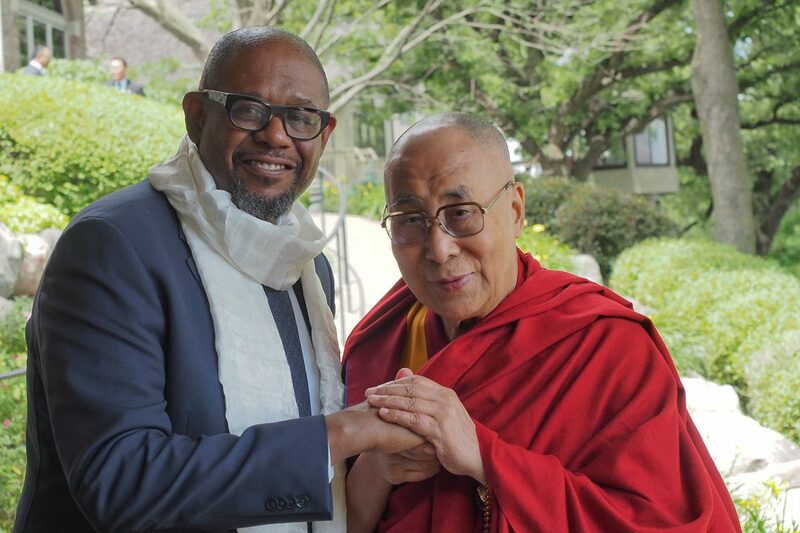 Forest Whitaker opened the morning’s conversation by expressing his gratitude for being in the presence of His Holiness, who, he said, Archbishop Desmond Tutu has called a beacon of light in our world. After suggesting everyone take a moment to relax, he asked the panel to define compassion. His Holiness answered directly. “Compassion is concern for others—sincere concern for others’ well-being founded on awareness of our own experience. Since it makes us happy when others show us affection and offer us help, if we show others affection and readiness to help they too will feel joy. The more compassionate our mind, the more we’ll be able to lead our lives transparently, honestly, truthfully, with nothing to hide. Compassion enhances our inner strength, reduces fear and causes friends to gather round us. As social animals we need friends and what attracts them is trust. And trust grows when we show real concern for others’ well-being. “Compassion enhances our self-confidence allowing our marvellous human intelligence to function properly, because fundamentally our mind remains calm. If instead we are angry our analysis will be biased, we won’t see the different aspects of reality. When the mind is calm we can take a holistic view which is more realistic. Bill Austin replied that for him, compassion is about having respect for life, which means protecting, defending and upholding life. Whitaker suggested relating what had been said to giving. Some people consider giving to be about physical gifts, but, he said, Mother Teresa had remarked that we should never underestimate the power of a smile. His Holiness categorized giving in four ways: giving freedom from fear, which implies saving life; giving material gifts; giving love and giving instruction or education. He made clear that giving freedom from fear is about protecting and defending the lives of others and could include the kind of work that Starkey Hearing Technologies does to help people hear better. The second could include providing facilities. The third is about giving with a sincere and altruistic motivation, compassionate giving rather than giving with a view to the reward you might gain. The fourth is about the kind of education people need to support themselves. To ensure their physical health and the health of their minds, people need to be aware of how to transform their emotions. Whitaker asked what makes for good, strong leadership and His Holiness replied. Bill Austin agreed, but added that for him what’s important is to lead by example. Highlighting the need for inner strength, His Holiness drew a distinction between our physical and mental experience. He suggested that a way to improve education would be to include an understanding of the workings of the mind and emotions. He mentioned that ancient Indian knowledge has much to reveal about this, and the difference between appearance and reality, that is relevant to us today. Compassion is one thing we need, but being realistic is another. Bill Austin recommended waking up every morning knowing not only that you can make a difference, but also that you have a responsibility to make a difference. Members of the audience had the opportunity to ask several questions. One related to the anger and polarization that is taking place in the political world and ways to bridge that gap. His Holiness responded that as a mere visitor he felt he would have to stay longer and really investigate what’s going on to be able to answer. However, he stressed that for many years he has told his American friends that it’s not the power of the US’s nuclear weapons that impresses him, but its fundamental principles of democracy, freedom and equality. These are what remain important and what we have to respect. Asked how to make things better he repeated that we have to improve the way we educate the coming generations. Brandon Sawalich wound up the morning’s proceedings by thanking the members of the panel for their thoughts—His Holiness especially. His Holiness was invited to join other guests of Starkey Hearing Technologies for lunch at the Austin residence on the shores of Bryant Lake. Afterwards he returned to his hotel. Tomorrow morning he will meet with members of the Tibetan Community of Minnesota before travelling to Boston in the afternoon.